Choose the best map mode for your subject: Map for cities, Satellite/Hybrid for details of particular buildings, Terrain for landscapes. An asterisk is next to dates when a full or new moon will be low on the horizon near the time of sunrise or sunset: these are often the best days for images including the moon. Use the time of day slider in Details mode to check the angle of sun. Ensure you have the optimal shooting position for the critical moment. Use the time of day slider and the secondary map pin in combination to check whether the sun will be hidden by a nearby hill or ridgeline. Scrub back and forth to see the track of the sun (or moon), choose your moment, but then double check by aligning the secondary map pin and comparing the angles. Use the secondary pin to set the elevation at the horizon. TPE will tell you how far you can see on a clear day, plus it will fine tune rise and set times – this can be important for mountain photography. It’s easy for sunrise to occur 10 minutes earlier due to the height above the horizon – don’t miss the magic moment. 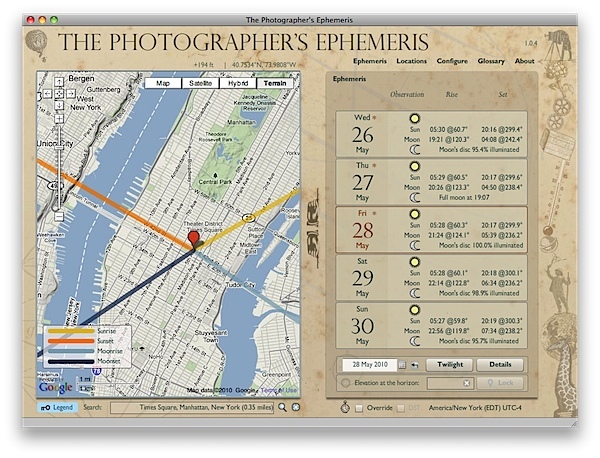 8)Use TPE to find the dates when sunset aligns with your favourite city street. Be sure to fine tune the sun position using the details slider so that it’s just above the horizon where you can still shoot it, then check the optimal date for the alignment with your chosen city street. Build a list of your favourite places. TPE doesn’t limit you to a preset list of towns and cities. Once you’ve found your shooting location, you can save the exact spot for future reference. TPE for iPhone and iPad is available for purchase in the App Store.